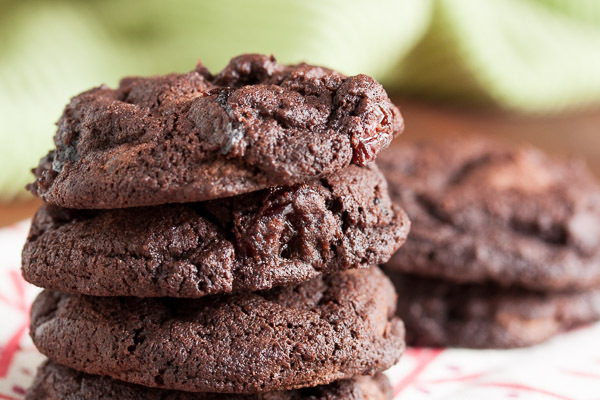 Double Chocolate Cherry Cookies | wanna come with? OMG, can I just start by saying this is an amazing cookie? Because this? Is an amazing cookie! Wow. Seriously. 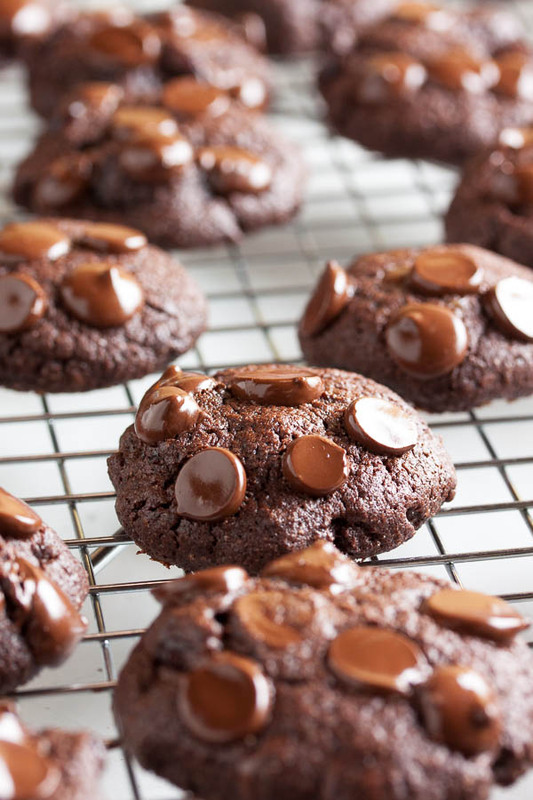 The cookie itself is intensely chocolate-y, made with both melted chocolate and cocoa powder, plus there are lots of chocolate chunks both inside and on top. And the cherries? Soaked in kirsch. Yum. And on top of all that, there’s a hint of almond flavouring too. My only complaint about this recipe is that it only made 39 cookies, and I want to eat them all. My recommendation would be to make a double recipe. And eat them all fresh from the oven when they’re still soft and gooey. This is the second special request from my coworker who’s leaving us (again, I say “boo!”). The first request was last week’s S’Mores Cookies (those were also amazing, and were all eaten in record time). This week’s request was simply “something with cherries”. So she’s getting these and also some homemade cherry lollipops. In addition to being delicious, this is also a really simple recipe to make. 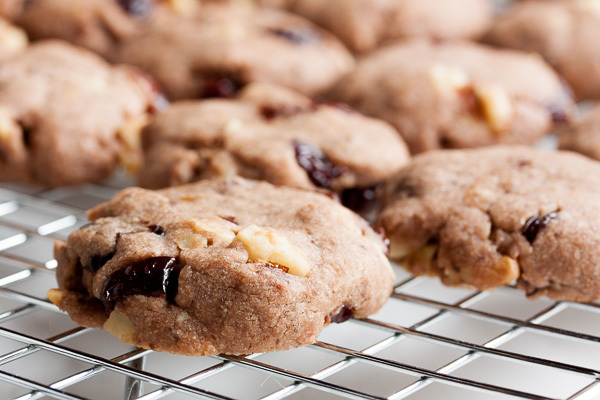 The last time I made cookies with cherries that needed to be soaked in brandy, they had to be soaked overnight and I kept forgetting to allow time for that step. These cherries only need to be soaked for about 10 minutes. So I started that first, and by the time I had all the other ingredients prepped, they were ready to go. Plus you don’t even need to use a mixer for this one – it’s all done by hand in a single bowl. The only slightly messy part is rolling the dough into balls prior to baking. With all the melted butter and melted chocolate, this is a very sticky dough. If you really wanted to, you could probably make these with a cookie dough scoop instead and keep your hands clean. 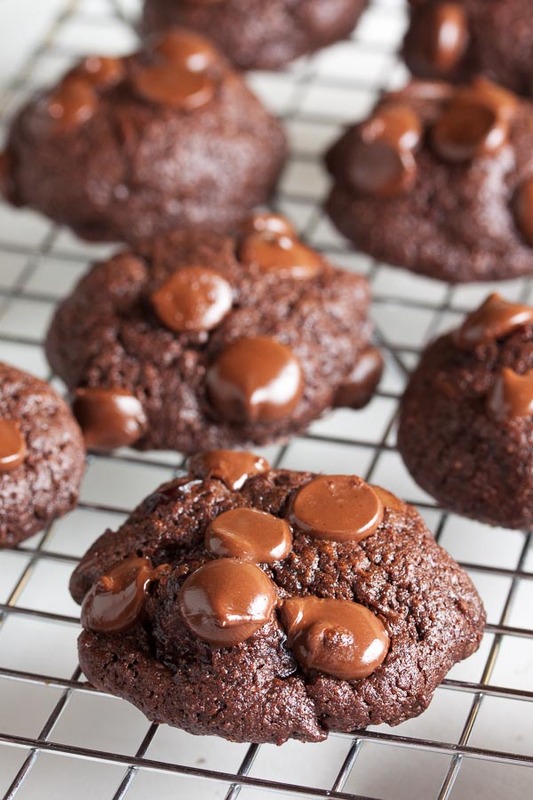 Adapted from "Dark Chocolate-Chocolate Chunk Cherry Cookies" from Simply Sensational Cookies by Nancy Baggett. The recipe says it will make 30 to 35 cookies, and I got pretty close to that with 39. 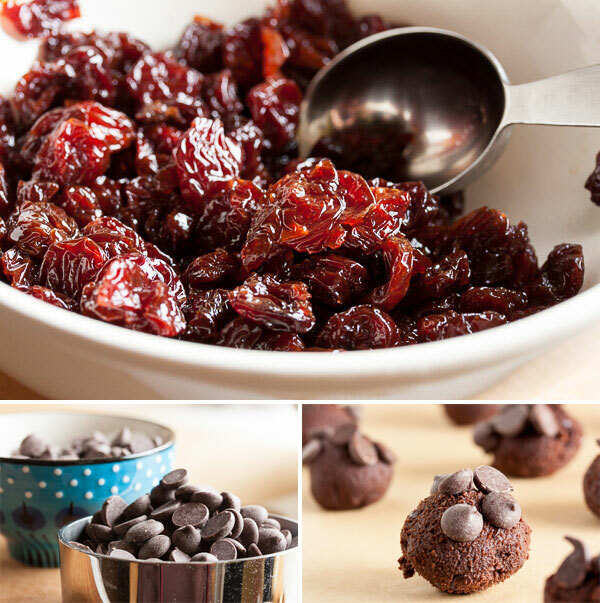 In a small bowl or measuring cup, combine the dried cherries and the kirsch. Stir well and allow to soak for at least 10 minutes (I just let it soak until I was finished measuring and prepping the rest of the ingredients). In a medium microwave-safe mixing bowl, combine the butter and 6 ounces of chocolate. Heat in the microwave 15-30 seconds at a time, stirring well after each burst of heat until there are just a few small chunks of chocolate remaining. Stir well until they're completely melted from the residual heat. Chocolate can scorch easily, so don't be tempted to speed this up. Add the sugar, cocoa powder, baking powder, almond extract, and salt. Stir well to combine, and then allow to cool to just lukewarm. Add the eggs, one at a time, beating well after each until the mixture is smooth. Add the flour and stir gently until just barely incorporated. Add in the cherries, including any remaining liquid, and 1/2 cup of chocolate chips either with a spatula or by hand (I generally prefer to add inclusions by hand to ensure they're evenly distributed). Cover the dough with plastic wrap and refrigerate for about 45 minutes. When ready to bake, preheat oven to 350°F (177°C). Put the remaining chocolate chips (1/2 to 1 cup) in a small bowl. Remove the dough from the fridge and form into small balls. Dip one side of each ball into the chocolate chips. 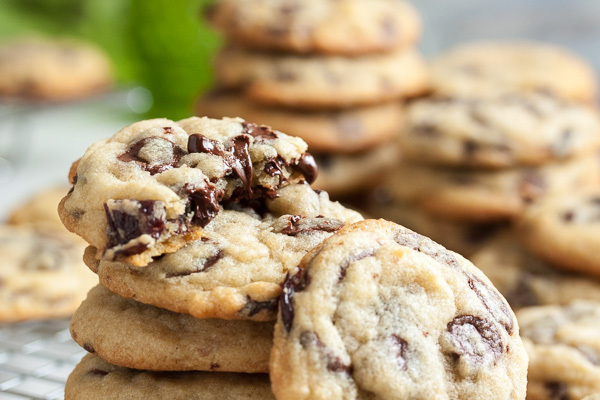 You don't need too many chips on each cookie – there are a lot already in the dough. Place about 2" apart on a baking sheet, with the chips on the top. Bake for about 9-11 minutes, rotating the pan halfway through. Allow to cool on a wire rack for a few minutes before removing the cookies from the pan and allowing them to cool completely.